Seriously, this is exactly the kind of confusing situation that intellectual property laws were supposed to prevent. But obviously they haven’t. How can two different companies both have characters called Captain Marvel? Isn’t that a violation of copyright or something? Well, it’s not a violation of copyright, because you can’t copyright a name. Copyright can only be applied to something more substantial, like a novel, or an essay, or (at the short end of the scale) a short poem. A complete comicbook character can also be copyrighted. But that means his appearance, his origin, his characterisation, etc. Not his name. Character names are only covered by trademark law, and trademark protection isn’t nearly as broad or secure as copyright protection. It only covers “marks” (such as logos or names) used “in trade” (the packaging and marketing of goods and services). Think of it this way: copyright applies to the entire contents of a book, from cover to cover. Trademark applies to only the cover. That’s because the cover is what shows on a retailer’s display rack: the marketing part. The DC “bullet” is a trademark. The Marvel “M” is another one. And so is the name “Captain Marvel”. Marvel Comics owns it. This means that DC can’t put that name on the cover of their books… not even the ones starring their own Captain Marvel. This is why his most recent comics series was called The Power of SHAZAM! instead, and why the 1970’s Saturday morning TV show was simply call SHAZAM! As a consequence, the character is actually better known among the general public by that name, rather than his own. It didn’t used to be that way. 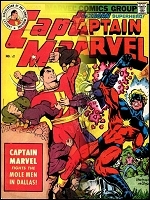 Captain Marvel (referring to the lightning bolt guy) used to be a household name. The words “Captain Marvel” could be seen on comics racks across America. For a while, his creative, whimsical superheroic adventures sold even better than Superman’s. But in those days, he was published by Fawcett, a rival of DC Comics. DC sued, claiming that Fawcett’s flying, super-strong, caped hero was a rip-off of theirs. To an extent, he was, but no more so than countless other superheroes to come along since 1938. He was actually unique from Superman in many ways (his alter ego was a human boy, he was magically powered, and the lightning bolt schtick was completely original). But Cap was a threat to DC’s übermensch, so they sued. Fawcett fought for years, but eventually settled, and agreed to stop publishing the character. The name “Captain Marvel” disappeared from the public eye for over a decade. One thing that makes trademark rights different from copyrights is that they don’t last a fixed term and then expire. They can last forever. Or they can evaporate from disuse. So as the years passed and the name “Captain Marvel” lay unused, it lapsed into the public domain. Then some clever folks at Timely Comics got the idea of rebranding the company as “Marvel Comics”. If they’d done that during Billy’s heyday, Fawcett could have sued them for using that name, but it was no longer an issue. Then Marvel dusted off the name “Captain Marvel” and applied it to a new character, one whose real name was Mar-Vell. They registered it as a trademark. It was theirs. More time passed, and DC licensed the rights to Fawcett’s catalog of characters, including Billy Batson and his alter ego. They later bought the property outright. They’d acquired the copyrights, but the associated trademarks no longer existed. And Marvel now had a lock on “Captain Marvel”. Which is pretty much where we are today. Mar-Vell has never reached Billy’s public familiarity; if you asked people on the street to describe “Captain Marvel” most would just shrug or stammer, but of the rest, the majority would describe the guy with the lightning bolt on his chest. Between his comics run in the 1940’s and his TV show in the 1970’s, he’s simply had more exposure. Being one of the few superheroes to die and stay dead hasn’t helped Mar-Vell’s current familiarity either. But with trademark law firmly on his side, he can beat Billy Batson any month of the year, in any court in the land. Then there’s the matter of Billy Batson’s British cousin: Marvelman. But that’s a huge can of wiggling, writhing, and still-very-much-in-question intellectual property worms. I’ll save that for another time. This item was posted on Tuesday, October 14th, 2003 at 4:58 pm	and is filed under Copyrights, Trademarks. You can follow any responses to this entry through the RSS 2.0 feed. You can leave a response, or trackback from your own site.